When I saw the photo of prints in a story about Amos Paul Kennedy’s Southern As exhibit which was being displayed in the art gallery at Samford University, of course, being the Inspired Southern that I am, I instantly had to find out everything I could about Kennedy and this exhibit. Kennedy was on campus for the closing reception and printmaking demonstration last week. I was determined to purchase a couple of his prints and to meet him. Walking into the gallery it was easy to see why he has such a huge following. His colorful prints lined the wall. 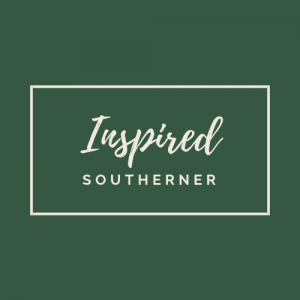 Each, as he says, are the same, but a little different, and depicted phrases that related to what most considered southern delicacies like okra, black eyed peas, collards, grits, sweet tea, catfish, and so on and so on. 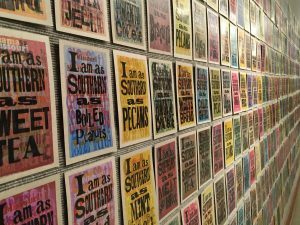 He said that there were 16 sayings that related to the South and Southern identity were depicted in this exhibit of 3000 prints. Kennedy is a delightful man and has a wonderful sense of humor. When I met him, I asked him if I could take photos of him for my day job’s Instagram account. He jokingly replied, “he would have to check with his lawyer to see how much to charge, because I couldn’t do it for free”. I laughed. When he asked me if I was going to buy all 3000 of his prints in the show, I, of course, didn’t miss an opportunity for a comeback by saying, “that I would have to check with my lawyer to see if there was enough money in the budget”. He thought that was clever. Kennedy lived in Alabama for many years before moving to Detroit, Michigan. I asked him where he lived in Alabama and he said “in a number of small towns, that you have probably never heard of.” I asked, “such as”? He replied,” in Gordo and York.” I told him that I actually have heard of those towns because when I campaigned and worked for one of Alabama’s governors, staff members became very familiar with the small towns in the state. According to the bio provided about Kennedy, he wasn’t always an artist. He fell in love with printmaking after a trip with his sons to Colonial Williamsburg, Virginia. He saw the town’s 18th Century print shop and book- bindery and he became interested in printmaking. 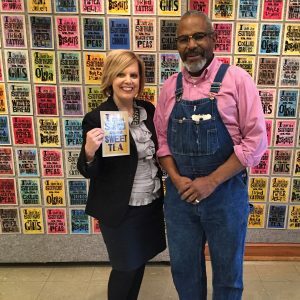 He has been credited with the revival of the letterpress in contemporary and folk art, as more and more artists look for alternatives to computer-generated art. Kennedy has a special place in his heart for the South as seen in his Southern As series. 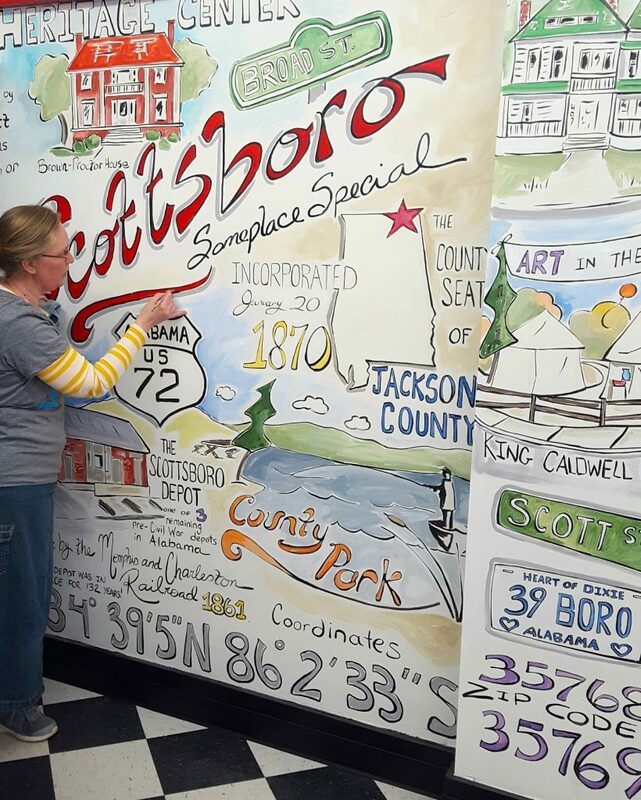 He plans to do other Southern series for his exhibits around the country. The southern art of quilting is the next series that he will do for the Southern Tour, which will be making a stop in Dothan, Alabama. He also has been at the Kentuck Arts Festival in Northport, Alabama in the past. Kennedy was the subject of the award-winning documentary, Proceed and be Bold and he is the 2015 recipient of the United States Artists Glasgow Fellowship which is given to a select group of artists who demonstrate innovation and continuing potential. The award makes him one of America’s most accomplished and innovative artists. If you get the chance, seek him out and go to one of his exhibits, I promise you won’t regret it.